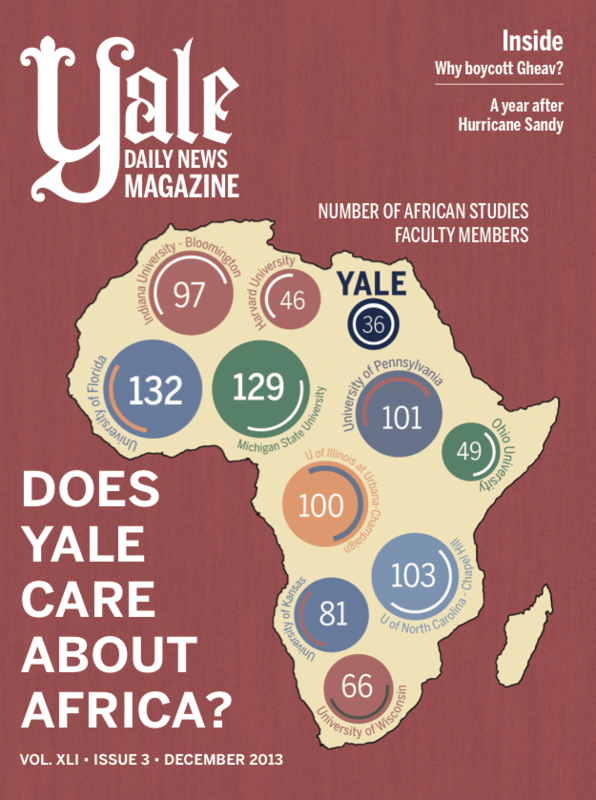 Another brief interlude to link you to an article I wrote for Yale Daily News‘ magazine edition, entitled “Looking for Africa.” It’s perhaps the biggest piece I’ll write on the subject, but I don’t expect it to be the last. It’s only a part of a larger conversation which the Yale community has been having, which I’ve linked to before. I hope you’ll take a look, and of course I’ll continue to write about the issue, as it’s important directly to me but also to the conversation about Africanist scholarship (and area studies) in U.S. universities. The Yale Africa Project (as it is now known) can and probably will do a lot for Africanist scholarship at the university, but that’s not difficult given the small and narrow focus of the university’s Africa focus now, but many of us are hoping it will do more. After recent faculty departures and downsizing across the area studies, it is good to see a focus specifically on Africa, but I’m not yet convinced it will fulfill its potential. Unfortunately, a lot of this is dependent on donors rather than university governance, largely because Yale hasn’t committed as much to the campaign as it could. My hope is that, in a couple of years, I’ll be able to say that I was wrong. I interviewed about a dozen people – professors, former professors, alumni, and students – and sent an e-mail survey to about a dozen African Studies students. I also worked tirelessly with two editors who took a 6,000 word statistic- and quote-ridden article and made it legible. The design team also put together a wonderful graphic for the magazine’s cover that essentially sums up why the piece needed to be written. I want to thank everybody involved for helping make it what it is, because they seriously deserve it. I also want to encourage everybody interested to continue to think about how Yale (or any university) can engage with the scholarship it promotes, and what it means to focus on Africa as a university. This entry was posted in Education, Elsewhere, Grad, Higher Education and tagged African Studies, Yale, Yale Africa Project. Bookmark the permalink.